Part 03 Why Should We Care? 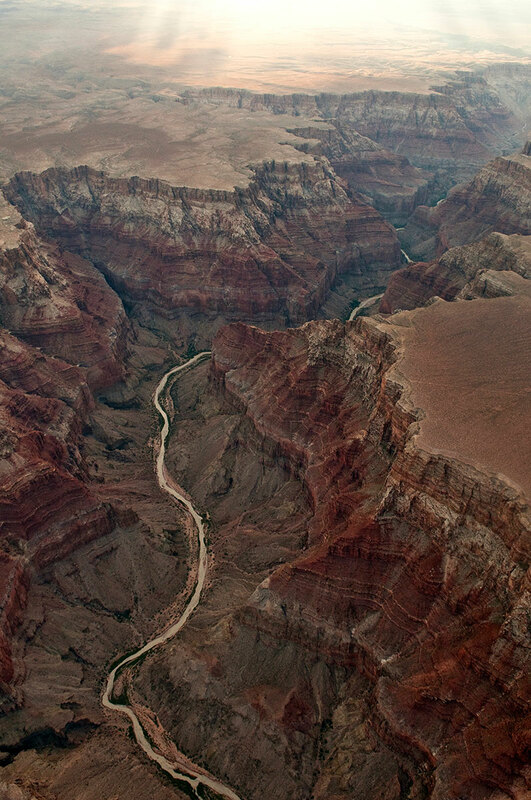 the Colorado River and its dozens of spectacular tributaries carved out the Grand Canyon and scoured the Rockies, flushing mineral-rich sediment to the sea. These rivers weren't always in flood, but they never ran dry. Today, however, the second largest tributary, the Gila, is mostly bone dry in its lower reaches through Arizona; the Salt River—supplying Phoenix—no longer makes it to a confluence with the Gila; the Santa Cruz is seen beneath Tucson bridges only during rare floods; and the Colorado River itself, almost unbelievably, stopped running to the sea in most years after the completion of Glen Canyon Dam in 1966. The river hasn't flowed to the Sea of Cortez in Mexico since 1998. What happened? In a word: agriculture. A steady march of population growth and climate change has exacerbated conditions, but it all began with farming, much of it supported by taxpayers in a feverish desire to "settle the West." After irrigation ditches and canals were hewed into the arid ground, farmers planted wheat, then hay. 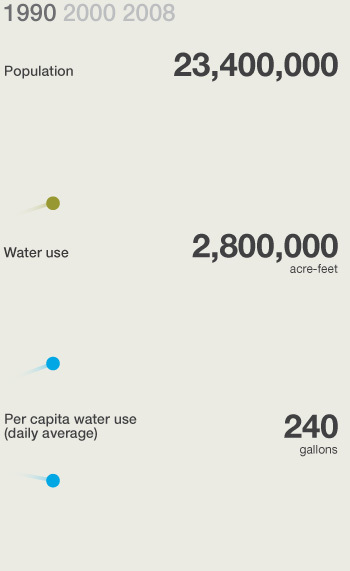 Those crops, along with cotton, citrus fruits, 90 percent of the nation's winter vegetables, and almost any other plant imaginable, now consume about 70 percent of the Colorado River Basin's water. Our green lawns, golf courses, swimming pools, and generally thirsty cities also take a share of the dwindling water, as do reservoirs, where 15 percent of the basin's water evaporates into thin air each year. 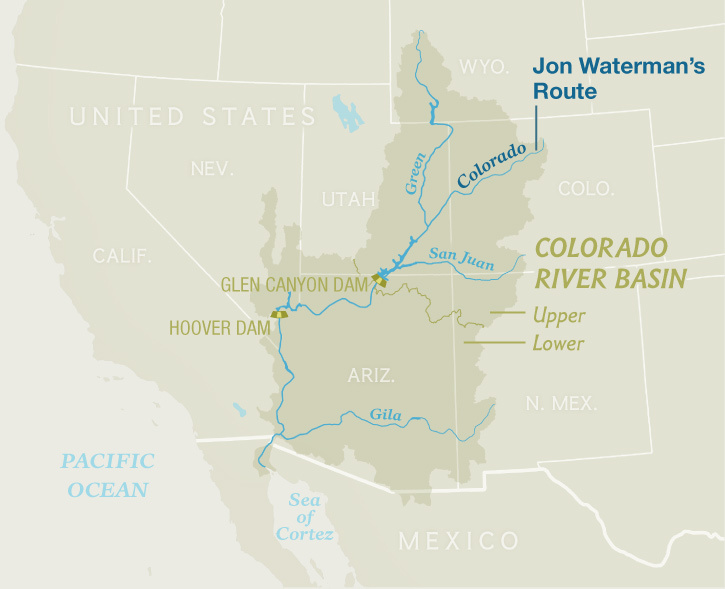 Although people tend to think of the Colorado as a single channel that slices through the Grand Canyon, the river system is really made up of scores of major tributaries that are collectively known as the Colorado River Basin. 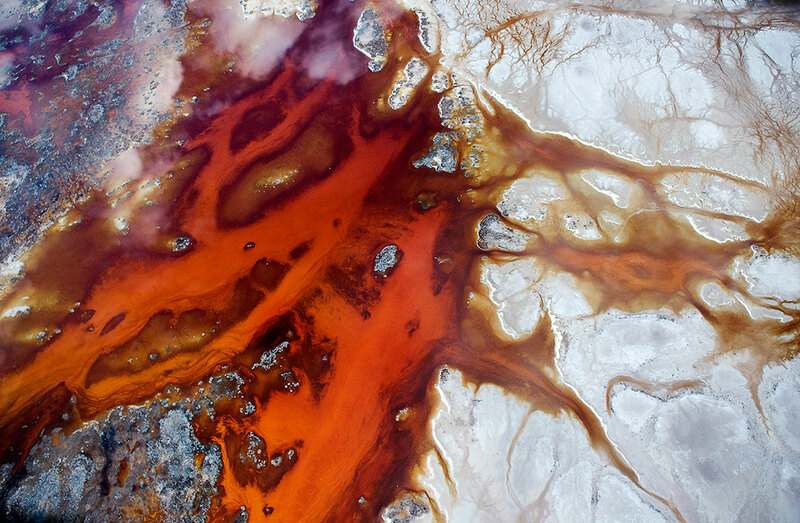 Running as red and warm as fish blood, or as emerald and cold as a glacial lake, its 242,000-square-mile (626,777-square-kilometer) drainage area alternates between the primeval and the altered. The basin's drainage covers a percentage of the U.S. that's almost identical to the percentage of Africa drained by the Nile. The Colorado River is both servant and scenic wonder to the 36 million Americans it supplies with water. 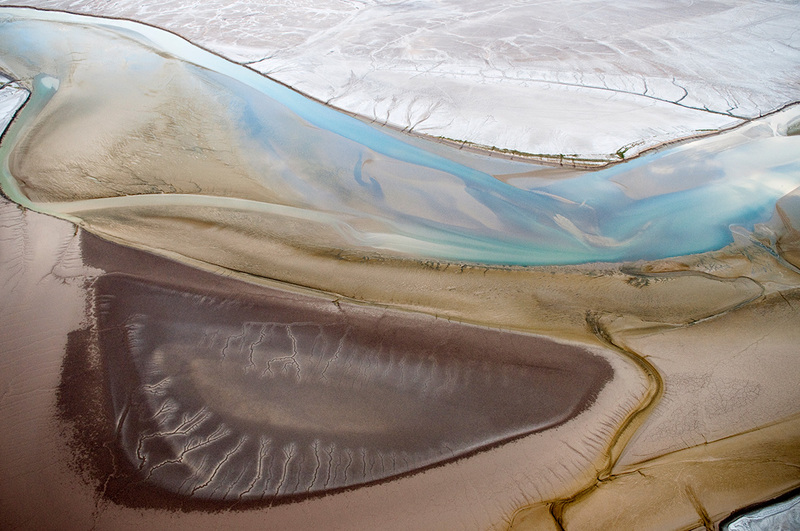 It is also one of the siltiest, most litigated over, and frequently paddled rivers in the world. It is now widely accepted that population growth and climate change will cause ever more intense water shortages in the West, much like the travails of Egypt over the long-disputed Nile. The Colorado River is both servant and scenic wonder to the 36 million Americans it supplies with water. Despite all this change, the massive Colorado River Delta, bearded with salt grass, is still one of the most wild and beautiful places betwixt source and sea: lush with unexpected groundwater in its center and surprisingly alive with rattling kingfishers, circling mallards, probing cattle egrets, mischievous ravens, prowling ospreys, and snakelike cormorants diving for fish. If you're listening carefully, the mournful cry of loons can be heard mimicking the howl of coyotes, as if to say, "Please give us back our river." Calamity, arguing with its split personality, Beauty. I know this because I've slept on the delta's muddy yet cracked, salt-stained sand, which washed down from the Grand Canyon. It took me five months to paddle there, 1,450 miles (2,330 kilometers) from the Continental Divide, plunging as much as 90 feet (27 meters) per vertical mile through bone-breaking rapids, then spilling out into reservoired calms that stretch for more than 300 miles (480 kilometers) of its path toward Mexico's Sea of Cortez. In the four years since that journey, I've continued my exploration of the Colorado River Basin's tributaries. My mission is to showcase the breadth and beauty of this river system, as well as investigate the changes of the last century. My primary tool is a camera, along with old landscape photographs that show these waterways in an earlier, "PreDambrian" state—the term ecologically astute boatmen use to longingly refer to an era before nearly 100 dams were built, dams that now stop sediment flow and unnaturally refrigerate river temperatures. The Grand Canyon's crux rapid, Lava, drops 37 feet (11 meters) in less than 100 yards and routinely flips the two-ton rafts of the best boatmen. Yet 195 miles (314 kilometers) upstream, unbeknownst to most of the two million annual visitors staring down at what they think of as the national park's violent central artery, the Colorado River is unnaturally controlled by the Glen Canyon Dam, standing 710 feet (216 meters) high. The Green River, the largest of the Colorado's tributaries, once flushed half of an ocean liner's worth of sediment 730 miles (1,175 kilometers) every day through Wyoming and Utah, briefly draining western Colorado before reaching its Utah confluence with the Colorado River. The particulate-carrying force of the Colorado River and its sandy tributaries then doubled—to an estimated six trillion pounds of silt per day—as it raced another 1,000 miles (1,600 kilometers) to the sea, building backwaters and sustaining flora and fauna with life-giving minerals. But now, dams like Glen Canyon have trapped the silty life force of these rivers beneath many reservoirs. My primary tool is a camera, along with old landscape photographs that show these waterways in an earlier, "PreDambrian" state. To demonstrate these effects I scour archives, from the National Archives in Maryland to the Bancroft Library in California, and when I find a compelling black-and-white image of a pristine river within the region, I seek out the original photographer's bankside camera stations and take a new photo. This work of "repeat photography" is akin to a treasure hunt: whole days of paddling, walking, or driving while trying to line up riverbanks with distant mountains just as they were aligned in the old photos—which were often captioned before modern towns and river place-names existed. Although I usually find my photographic quarry, in many instances the scenes are so overgrown with towering invasive plants that I can't see, let alone photograph, the river. Still, more often than not, I strike gold. As if disembarking from a time machine, heart pounding, I stand in the footsteps of the great, glass-and-gel-plate, pioneer lens men like Timothy O'Sullivan, who learned his craft while photographing carnage on Civil War battlefields and then arduously hauled his boat up the lower Colorado; William Henry Jackson, who opened a photography studio in Denver after accompanying government survey teams around Western rivers; and a latter-day disciple, Louis C. McClure, who photographed dams, railroads, and river-irrigated agricultural areas in the Colorado River Basin into the mid-19th century. Discovering their historic camera stations and unveiling radically changed riverscapes always makes me feel like I have unearthed buried anti-treasure, revealing the secret, hidden costs of Western reclamation. In this post-DamNation, one of many restoration projects targets ancient fish that still swim in the basin's waters. Four of these warm-water, silt-adapted species—the pike minnow, the humpback chub, the bonytail chub, and the razorback sucker—are now endangered because the silt- and migration-blocking dams also refrigerate the water temperature by dropping cold, mid-level (instead of warm, surface) reservoir water into the rivers below. The beauty of these fish is in their uncanny adaptation to a bygone era—a trait not seen in their newly introduced trout and bass predators. In the PreDambrian, pike minnows ranged over 1,000 miles (1,600 kilometers) of river and grew to 5 feet (1.5 meters), but they are now as stunted in range as they are in growth. The humpback chub has neuromast chemoreceptors on its head, allowing the species to smell (rather than see) faraway food in silty water. The torpedo-shaped and camouflage-backed bonytail chub, rarest of all the native fish, disappeared from the Lower Basin after the construction of Hoover Dam. And the tuba-lipped razorback sucker dwells in deep water, avoiding ultraviolet light; while mating, the male flashes its uniquely adapted eyes to reflect ambient UV light and scare off any male competitors. These four species have no commercial value. If caught by fishermen they have to be immediately released, and they're passed by in favor of the more palatable, non-native sport fish. Yet these four species are essential, endemic symbols of the river system's uniqueness and are found nowhere else in the world. Dams have flipped off their evolutionary light switch. Like these fish hidden beneath the water, human-caused alterations on the surface are complex, and my image pairs don't always show the ill effects or root causes of the river basin's transformations. Population growth is one factor affecting the rivers. Over the last century, more people has meant more demand for water. 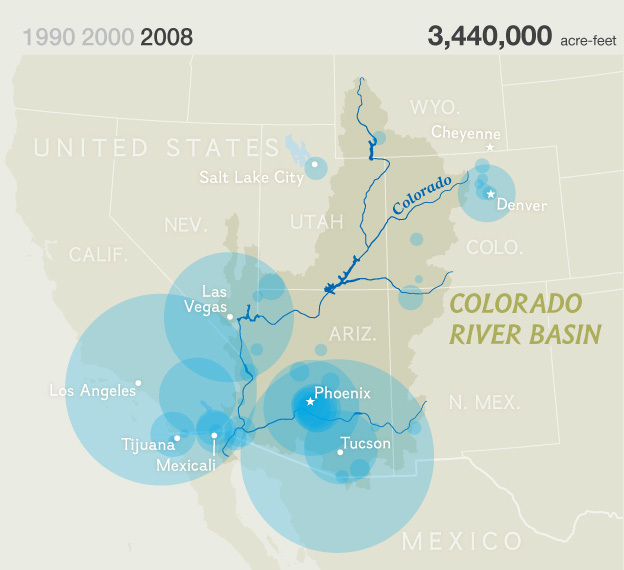 Since first apportioning river water to seven states through the Colorado River Compact in 1922 and subsequent agreements, the basin states' population has increased ninefold. 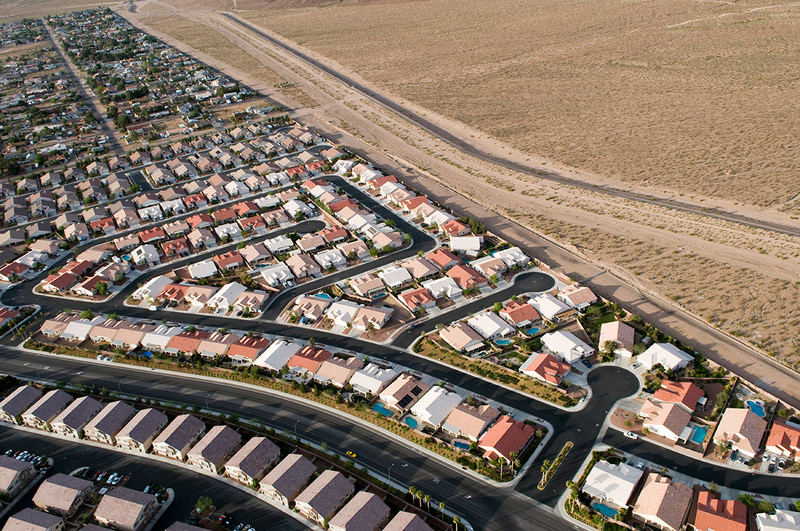 According to the U.S. Census Bureau, many of the cities dependent on basin water have grown even more: The greater Las Vegas area in 1920 had just over 2,000 people; now it has almost 2 million. 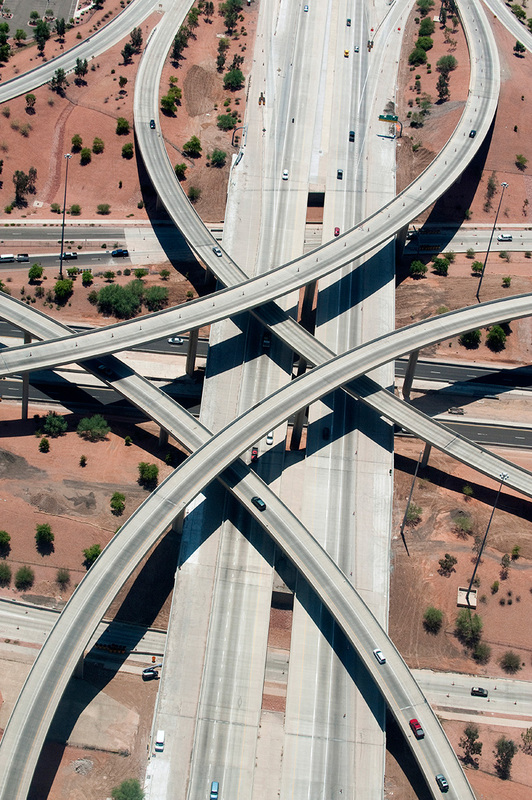 In 1900 Phoenix had 5,554 citizens; today it has 1.48 million. 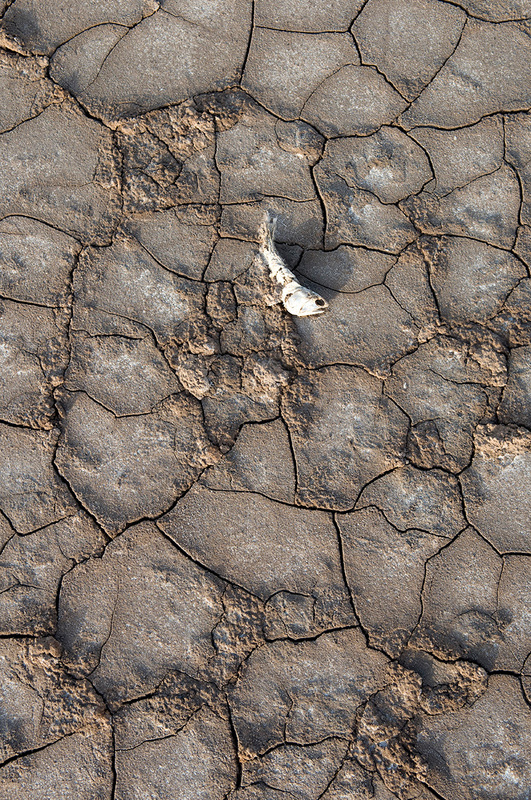 Although forecasting how changing climate will affect water within the basin is an imprecise science, scientists expect the region to get hotter and drier. 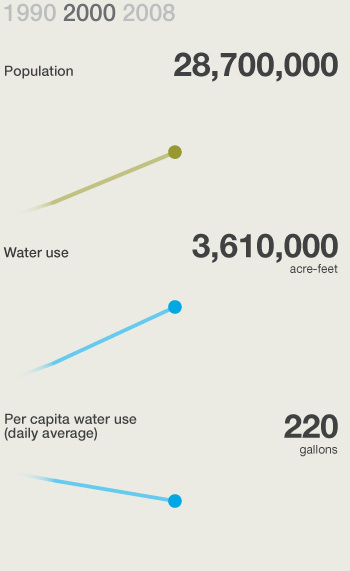 A study by the Department of the Interior's Bureau of Reclamation (the federal agency that manages the Colorado River) in August 2013 projected that the water in Lake Mead will decline to 1,060 feet (323 meters) by July 2015, which would likely result in water shortages being declared for 2016. The Bureau of Reclamation also recently released a study predicting that by 2060, the Colorado River's flows will decline by 8.7 percent. 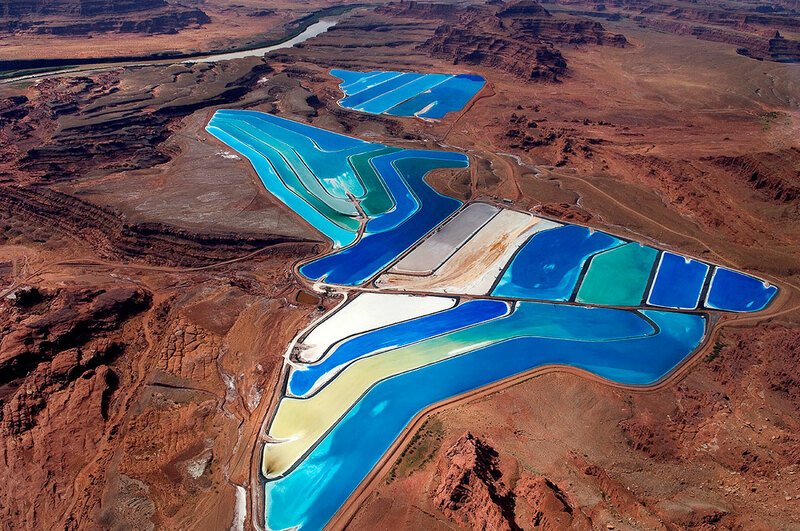 That's equal to the amount of water canaled to Los Angeles, which gets half of its water from this river. Other models show even greater declines. As for the lingering drought that began in October 1999: Historically, droughts are a part of normal climatic variations, yet tree-ring records show only three longer droughts in the basin within the past 1,300 years. Studying my then-and-now image pairs for signs of a changing climate, I find evidence of recent forest fires, loss of river flow, and natural and unnatural geomorphologic changes such as destruction of meanders and disappearance of sandbanks. I also see the growth of invasive and water-consumptive plant species like tamarisk and Russian olive, along with an incredible greening of river valleys that were barren in the 19th century. 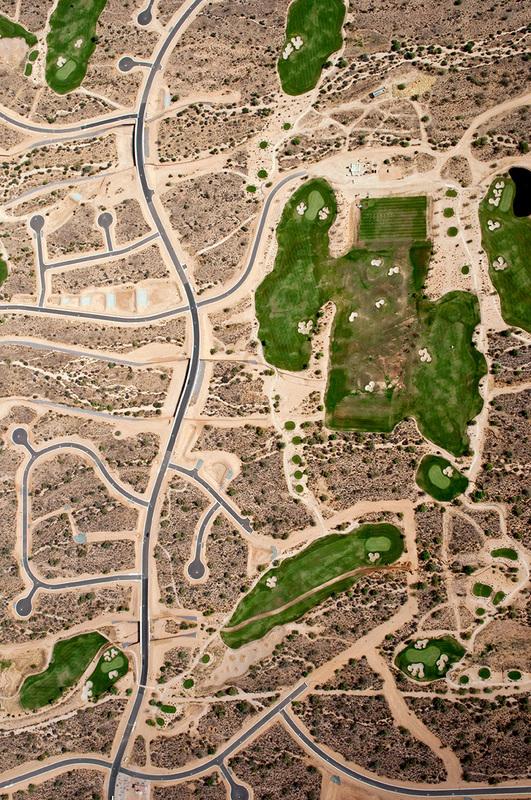 And there are many signs of the conceit of human engineering, from ditches to dams, transforming once pristine rivers throughout the southwest into sportsmen's paradises—in other words, reservoirs—frequented by loud motorboats, harboring the gasping Asian carp and invasive quagga mussels, and heavily stocked with sport fishes; and irrigation canals, contaminated with pesticides and agricultural runoff, that largely serve dairy cows (60 percent of the water used for irrigation, or about a third of the river, goes to grow hay and forage crops, according to the Pacific Institute). 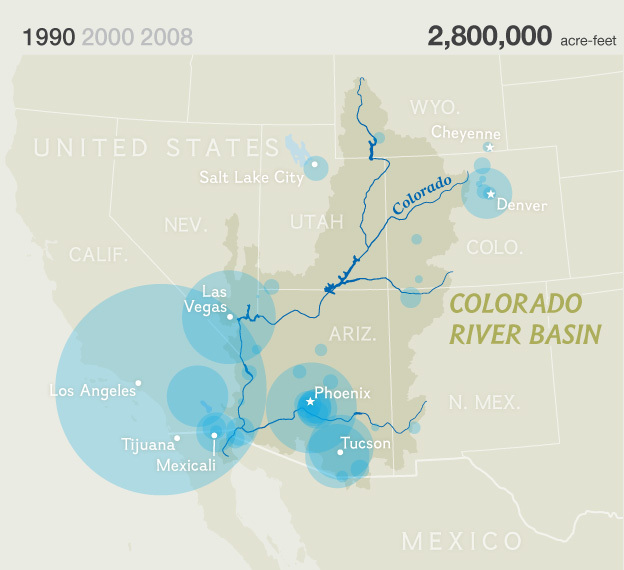 From 1990 to 2008, the number of people relying in part on Colorado River Basin water grew by ten million. Yet individual consumption rates fell, as did the overall water use from 2000 to 2008. These reductions in delivery and consumption reflect various successful efficiency and conservation efforts. 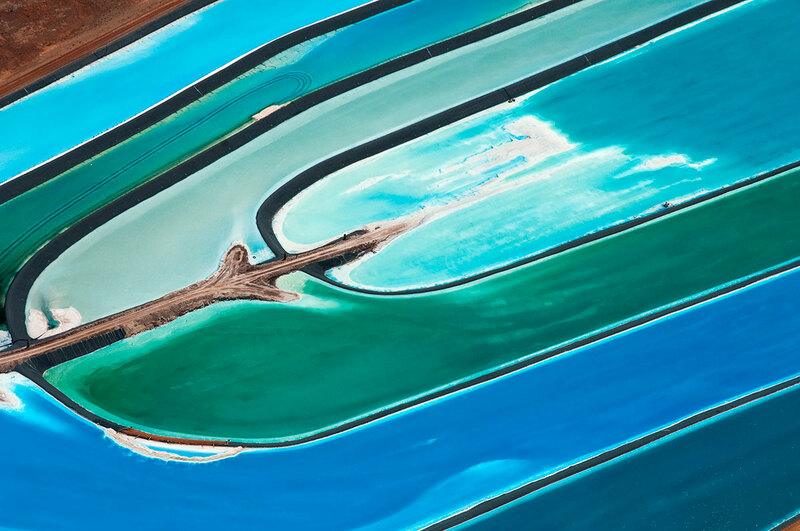 Continued focus on careful consumption could go a long way toward meeting the water needs of a growing population in an already strained basin. and hundreds of other species that rely on the river, we should care because the Colorado flows through all of us. Many of us use it in our showers and pools, and in the fountains and green parks that our children play in. It is real estate (equity plummets with water levels). It is our wallets: a collective $26 billion per year from the recreation economy, and 250,000 sustainable jobs. It is our livelihoods: I have friends who depend on the river for their work as boatmen, fishing guides, defenders of water rights, teachers, photographers, hay growers, farmers, and realtors. We eat the river in cheese and beef and vegetables, products that are made with water from the Colorado and then shipped all over the world. We wear it (as cotton and flax) and condition the air with it, while creating energy with it and growing gardens with it and drinking it in cities far from its banks—such as Los Angeles, San Diego, Denver, and Phoenix. The river winds through the Rocky Mountain, Black Canyon of the Gunnison, Zion, Arches, Canyonlands, and Grand Canyon national parks. We hike along it, swim in it, and skip stones in it. Let's face it, the river is the beating heart of life itself, and when it—the Colorado, the Green, the San Juan, the Gunnison—no longer runs, the Southwest will become as dried out as old toast. There are many solutions for the Colorado. Conservation—large-scale xeriscaping (switching to landscaping plants that don't need much water), irrigation reform, a more watchful eye on the consumptive water-energy nexus, and discretionary crop planting—can send a lot of water back to the rivers where it belongs. 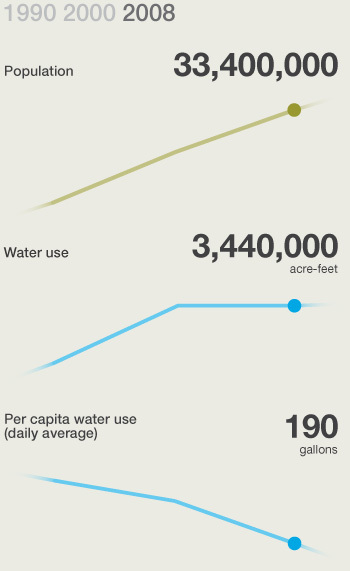 According to a recent report from the Pacific Institute, "replacing about 10 percent of the basin's irrigated alfalfa acreage with cotton and wheat could save about 250,000 acre-feet of consumptive water use each year." And water use by the Colorado River's outlying farmlands, such as those in the Imperial Valley near the Mexican border, could be halved if farmers irrigated their crops with pipes underneath the soil—as in Egypt, which is experimenting with saving Nile water through the use of drip irrigation near the Sudanese border. For all the good ideas yet to be initiated, there are as many energy-intensive proposals—such as canaling Green River water over 500 miles (800 kilometers) from Wyoming to Colorado, building desalination plants, or laying pipelines from the Missouri River—that would only accelerate the effects of the original reclamation engineering and increase the greenhouse gases that helped create today's dilemmas. To reverse the ominous trend of southwestern water wastefulness and river destruction, we need more good news like this: In November 2012, the so-called "Minute 319" was added to the 1944 International Treaty on the river. The agreement says that over a five-year trial period, a total of one percent of the historic flows will be sent south to the Colorado River Delta to rejuvenate native flora and fauna and, hopefully, to reach the sea. 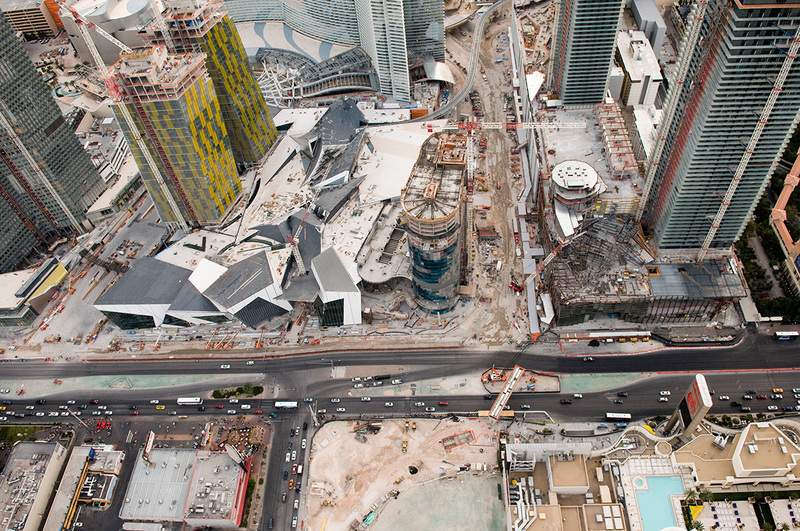 Although one percent is not a lot of water, it will simulate the seasonal floods of old and keep the riverbed wet. Minute 319 is a unique collaboration between the Mexican and U.S. governments and a coalition of conservation organizations, each of which is responsible for delivering a third of the water committed to the delta under the agreement. In addition to helping set restoration goals, conservation groups are raising funds to buy water rights from current users. In time, if we follow this example of budding restoration, we'll have the opportunity to revive dozens of other western rivers. Or we can begin bidding them goodbye. While I was paddling from source to sea, a week's journey below the Continental Divide, in a terrific wind near Kremmling, Colorado, I had an encounter that encapsulated the work we need to do for the river. A rancher on the shore angrily shouted that I was trespassing. But I hadn't touched his land, so I pulled over to talk. 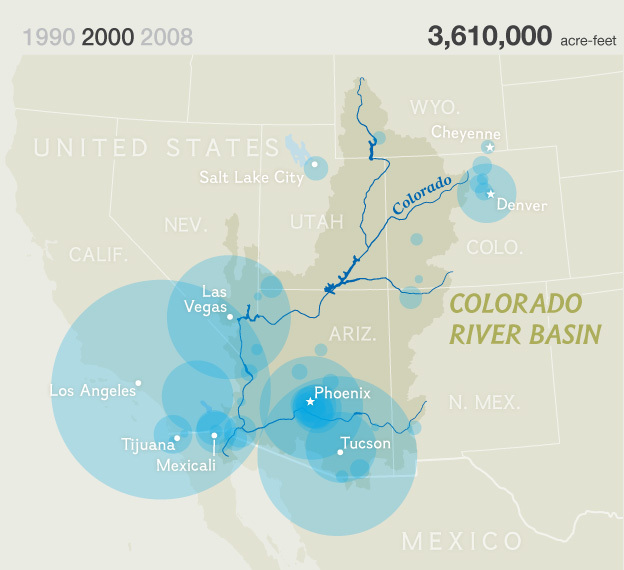 Water from the Colorado River Basin meets at least some of the residential and commercial needs of tens of millions of people, over two-thirds of whom don’t live inside the basin. A 2011 Pacific Institute study, the most up-to-date survey of the top 100 cities and agencies consuming basin water, showed that such non-agricultural water deliveries increased by 640,000 acre-feet from 1990 to 2008 in those cities. "The river is going to hell in a handbasket," he said, referring to changes on the river, including a recent catastrophe caused by a neighboring rancher who had opened up a ditch headgate in low water and drained the Colorado headwaters for a day. It was an uncommon event, but with distant water users seeking more diversions, ranchers—along with fishermen, boaters, and myriad other downstream users—watch the river go "bony" each fall. Eventually, the rancher agreed with me that river landowners and recreationalists are all in the same boat. 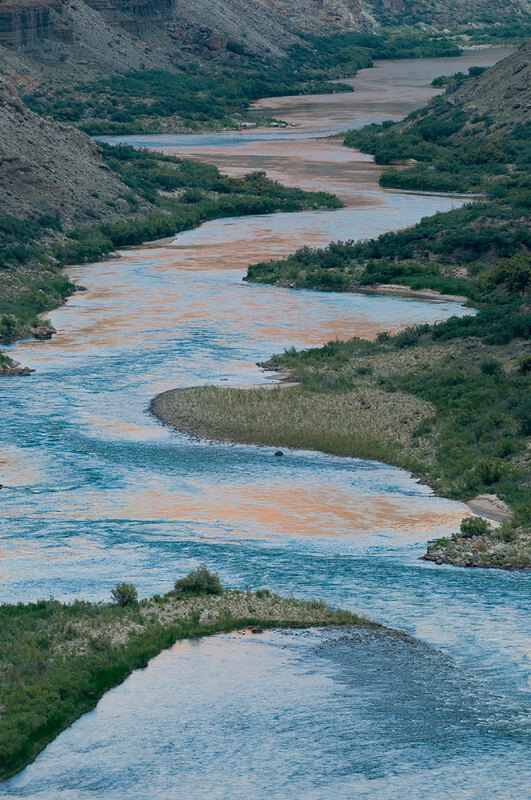 More than 36 million of us depend on this ancient river, although it's used and undoubtedly adored by millions more. We can read more than a billion years of time on the walls it has carved. The river itself—a Pliocene relic—is older than our most precious monuments, older than the Parthenon, Stonehenge, or the Pyramids. It predates us all. The least we can do is save it for our children. 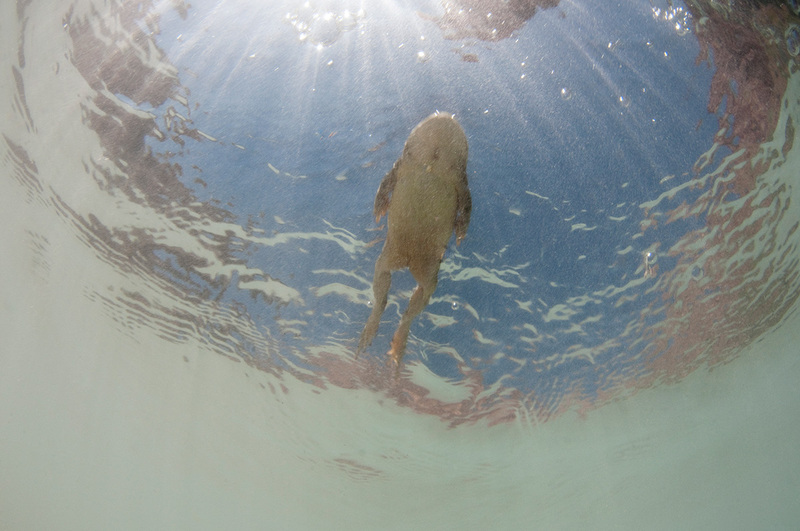 Jonathan Waterman is a writer and photographer based in Colorado. 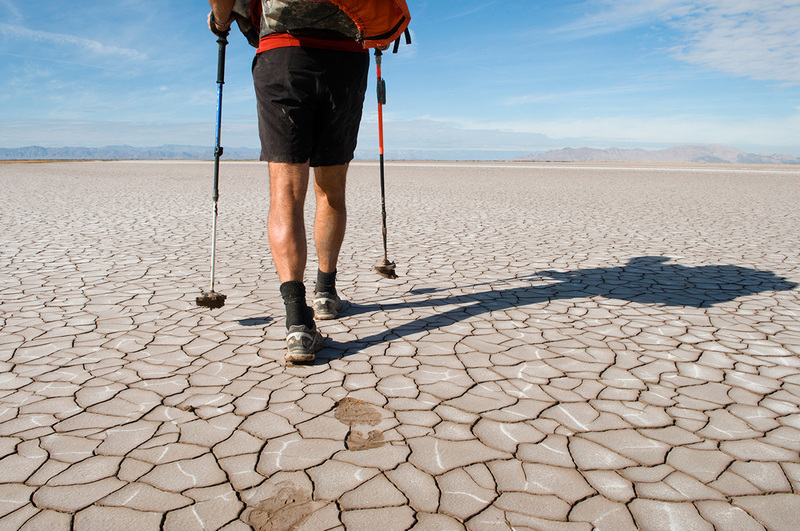 In 2010 National Geographic published his book Running Dry: A Journey From Source to Sea Down the Colorado River. He is also the coauthor, with Pete McBride, of The Colorado River: Flowing Through Conflict. Produced by Dana Fraser, Chris Moore, Maggie Smith, and Chan Young Park. Text editing by Brian Howard. Copy editing by Leanne Sullivan. Quality assurance by Emily Shenk. Video courtesy of University of North Carolina, Chapel Hill.